Microsoft SQL Server Reporting Services (Learn SSRS). Like analysis Services, Reporting Services was originally one type of an add-on for SQL Server, but now it’s a part of the main product. In this SQL server reporting services tutorial, you will learn how to utilized SQL server Reporting Services 2008 R2 to create your own reports. This tutorial focuses on Reporting Services Architecture, Report Designer, and Report Wizard. We are going to discuss various modes in SQL server reporting services tutorial and step by step implementation of SQL reporting services with the help of infographics. After completion of how to remove shortcut virus from pen drive infographics, we received a lot of positive comments. We went ahead with explain the Advantages of Microsoft excel in the next article. And here, we are explaining the SQL server reporting services tutorial in 15 steps (SSRS Reports Examples). 1 SQL server reporting services tutorial 2008 R2 -: Modes. 2.1 If you wish to use this info graphics just contact us. 4 Follow these steps to create your first SQL server 2008 Report. SQL server reporting services tutorial 2008 R2 -: Modes. This is a normal mode, in which, every time a report is run, data is fetched from the database and placed in the report. This gives us an updated and fresh report. But execution query runs depending upon number of users. Thus this mode might slow down the database server. To increase performance in computer world we use cache. Here same techniques is used. If another user request server report, same report is placed to the user form cache. It reduces the number of requests sent to the server. Thus the performance is enhanced compared to “On-Demand” request ,but makes sure that user do not receive too much old data. Technical support interview questions and answers. We will start SQL server 2008 reporting services tutorial with Reporting Services Architecture. It has a few components that work together to produce best reporting solution. The complete SQL reporting services architecture consists of development administration and report viewer tools. It can create any report, but requires you to get details about structure of your data and to be able to use visual studio interface. It provides simple interface for effectively create a report. Report builder can be used by any business user. It requires to set up the data model before the end user uses it. In this SQL server reporting services tutorial, we will start with Report designer. It’s readily available in BI (business intelligence) development studio. Once we cover Our first tutorial based on Report Wizard ,we will then look at the design tool. Oh! If you don’t have BI development studio just click business intelligence development studio. Do you know how to monitor SQL server performance? Check SQL tuning. Why we prefer Report Wizard? Report wizard is best tool which gives you easiest way to develop a report. Thus in SQL Server Reporting Services tutorial we prefer it. This infographics gives you the best view how to create Report in 15 steps. It consists of following steps. Write query to retrieve data. Create layout of your first SQL server report. If you wish to use this info graphics just contact us. We recommend, before creating report, just take an overview of your relational database management systems. Go through SQL query join table, also learn some SQL query interview questions and answers. Follow these steps to create your first SQL server 2008 Report. Open your business intelligence development studio. This would have Mostly came with the SQL server management studio download. If you don’t have, download and install it. Once you open BI development studio. Go to file, select new project. In New project wizard, choose business intelligence projects type and take report server from project wizard template. Give the name to new report. In this SQL server reporting services tutorial we named it as test. After naming, browse preferred location to save your first report. Once location is selected , click OK. Welcome to the report wizard will appear. 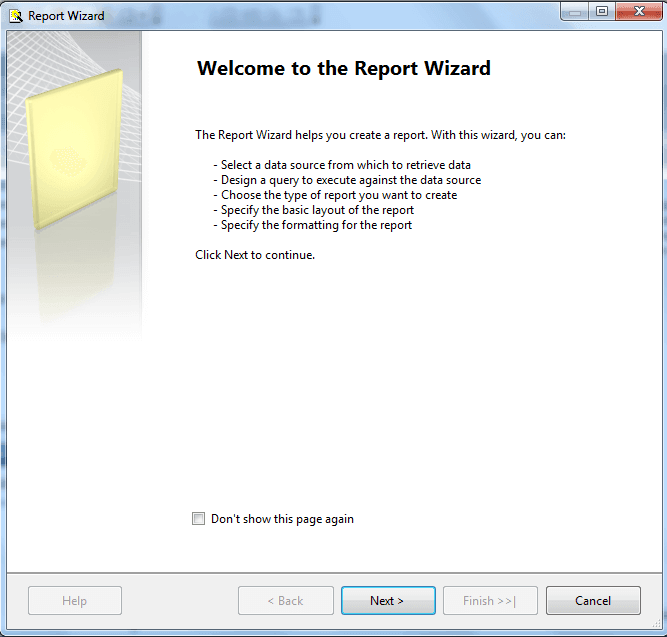 It indicates, what is a use of report wizard, list of operations you can perform with help of report wizard. Read the page and click next. Next , select a data source. Name the new data source, select type as Microsoft SQL SERVER. To make this data source available to other SQL server reporting services, select make this shared data source box and click on next. Here you can specify a query to execute to get data for the report. To create query using query builder, click on query builder button. Select the type of report you want to create. There are two options, tabular form or matrix; we will go for tabular option. Select tabular option and click on next button. Now you get interface where you can easily design a table. You can group your data. In our SQL server reporting services tutorial, we have grouped products based on colour. Select the colour and click on group button, Select other values and click on details. Go to next. Choose layout interface gives you option, type of layout for report. Select stepped and go to next. Read report summery and click on finish. Data Set window indicate the data that is applicable to report. Design window indicates view the structure. You can see a preview of result. This SQL server reporting services training focus on SQL server 2008 reporting services with example. Create stored procedure using SQL server 2008? What is PCB stand for? 5 Best free PCB design software. In this first edition of SQL server reporting services tutorial (SSRS Basics), we have given step by step introduction of report wizard. In next part we go through how to modify a report?